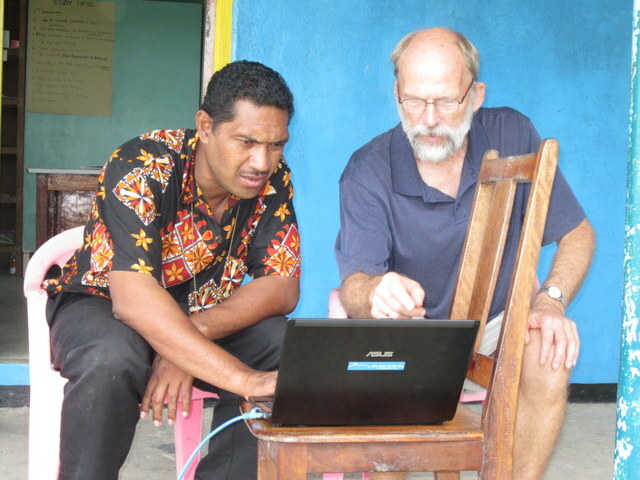 In November 2013 Nico Daams spent 10 days in Lata, the administrative center of Temotu province, training Walter Tamasia, the newly appointed translation coordinator for the Tikopia project. Walter grew up in Nukufero, the Tikopia settlement in the Russell Islands, and he recently completed his theological training at the Bishop Patteson Theological College on Guadalcanal. Walter was ordained as a priest in the Anglican Church about a week after Nico left. He is married and has two little children. Together Nico and Walter made a new plan to complete the translation of the Tikopian New Testament. Walter will pay lengthy visits to the various Tikopian communities in the Solomon Islands and seek out people with proven ability in the language, who together will form a virtual translation committee. Distances and shipping schedules prevent them from ever all being in the same place, so we hope this will be a good alternative. After Walter has checked through the various books that have already been advisor-checked with these men and women, they will then distribute and collect them to be reviewed by a larger group of people. With a satellite terminal supplied by the Seed Company, Walter and Nico will be able to stay in contact, so the long periods of silence that have charaterized this project are hopefully a thing of the past.